Arrive Delhi, meet & assistance and transfer to your hotel. Overnight stay in Delhi. After having breakfast, proceed for Old & New Delhi sightseeing tour. The Old Delhi sight-seeing tour includes visit to Raj Ghat - the cremation site of Mahatma Gandhi; Jama Masjid - largest mosque in India. A comprehensive sight-seeing tour of New Delhi includes visit to the Qutub Minar, the Humayun's Tomb, drive along the ceremonial avenue - Rajpath, past the impressive India Gate, the President's Residence, Parliament House, ending up with drive through the Diplomatic Enclave. Overnight stay in Delhi. After breakfast leave for Jungle Safari in National Park, Corbett. 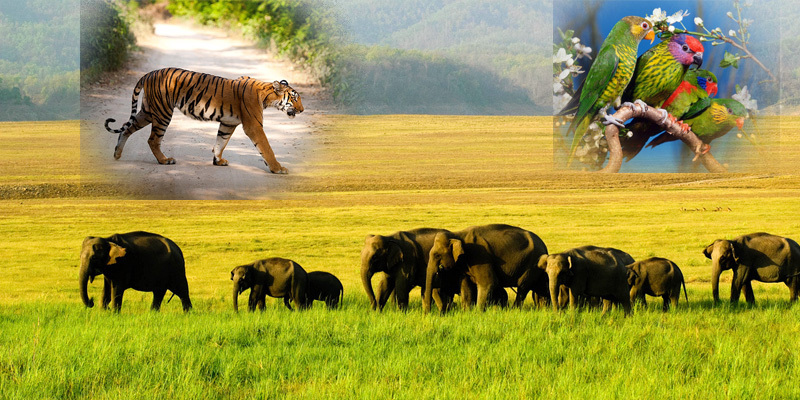 Corbett has the highest density of tiger in India. Other carnivores include the leopard, elephant, bear, deer. Basking along the banks of the Ramganga are the slender snouted gharial and the marsh crocodile. There are watch towers, elephant safaris and jeep safaris for wildlife viewing. Night stay in Corbett. Morning after breakfast drive to Bharatpur en-route visit Fatehpur sikri, a perfectly preserved red sandstone "ghost town" which was the estranged capital of mughal emperor Akbar, built in 1569 and deserted when its water supply failed. After visiting continue drive to Bharatpur. Arrive Bharatpur & check in at hotel. Night stay in Bharatpur. In morning visit Bharatpur Bird Sanctuary - Bharatpur Bharatpur National Park is among the finest bird parks within the world. Bharatpur Bird Sanctuary (Keoladeo Ghana Natiuonal Park) is a national reserve, declared a reserve parks of India by the Government. It imparts protection to faunal species as well as flora species. Indigenous water- birds, waterside birds and migratory water birds, Siberian migrated birds, and several species of animals and mammals can be seen at this place. It’s a paradise for bird watchers. Overnight stay at Bharatpur. After breakfast drive to Ranthambhore. Arrive Ranthambhore and check-in at hotel. Rest of the day at leisure. Night stay in Ranthambhore. Situated in the south of Jaipur, Laxmi Narayan Temple is one of the many such temples built by wealthy Birla family in India, thus it is also known as Birla Mandir. The temple is a great reminder of the secular traditions India has shown over the centuries. The temple has been constructed in white marble and has three domes, each portraying the different approaches to religion. The temple is situated at the foot of Moti Doongri Fort, converted as a small palace by Ram Singh II for his wife Gayatri Devi. The ornamental facade of this "Palace of Winds" is a prominent landmark in Jaipur. Their five-storey sandstone plastered pink structures encrusted with fine trelliswork and elaborate balconies. The palace holds 953 niches and windows. Built by Pratap Singh in 1799, the Mahal had been a royal grandstand for palace women. Overnight stay in Jaipur.